What is a Per-lap Pledge? Per-lap Pledge means that you pledge a dollar amount for every lap that your participant completes at the Ultra Fun Run (not to exceed 35 laps). 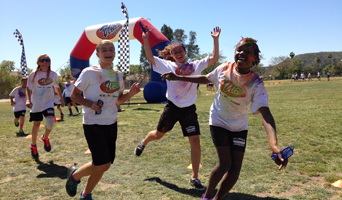 Each lap around the Ultra Fun Run raceway is 1/16 of a mile. Participants run for 30 minutes. Most participants run between 25 - 30 laps. Great news! You can register up to 5 children under one parent at the same time. How are the prizes calculated and earned by each student? Prizes are awarded to each student based on total points earned. There are two ways to earn points. 1) Earn 1 Point for each $25 in Flat Donations, 2) Earn 1 Point for each $1 Per-lap Pledge. You will receive a link to pay your pledge on the pledge request email sent by the participating student. After the Jog-A-Thon, a follow-up email will be sent to each Per-lap sponsor informing them of the number of laps run by the student and their total pledge amount. Can parents come to the Ultra Fun Run? Yes please!!! The more parents the better! "The sensor that counted my laps worked like magic. It was so cool!" "My school made so much extra money we could buy a rocket ship and send the science teacher to the moon." "The carnival was so much fun. I laughed so hard my cheeks hurt!"